Ken Loach rarely makes documentaries, and when he does, they’re usually about an urgent topical issue, such as the 1980s miners’ strike (‘Which Side Are You On?’) or the 1990s Liverpool dockers’ strike (‘The Flickering Flame’). On the surface, ‘The Spirit of ’45’ takes a longer view than those films. 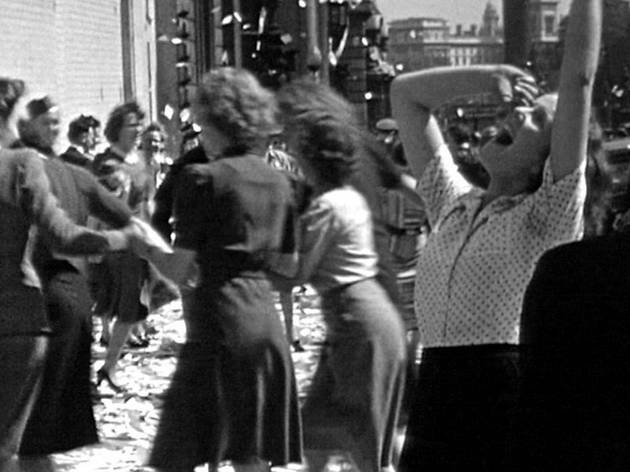 This rousing and saddening film reminds us of the air of progress and reconstruction that took hold in British politics immediately after World War II. It takes us right back to the founding of the welfare state and, with it, the nationalisation of the health service, transport, energy, housing and other areas of public life, as initiated by Clement Attlee’s 1945-1951 Labour government. 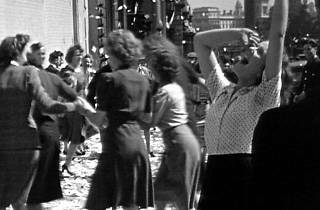 The faces we see at the beginning of the film of young Britons celebrating in the fountains at Trafalgar Square in May 1945 symbolise the hope of a nation: that things can only get better after six years of war. But Loach, the director of ‘Kes’ and ‘Looking for Eric’, is equally concerned with the spirit of modern Britain. For him, the socialism of our past – of Attlee and his comrades Nye Bevan, Herbert Morrison and others – could teach the present a thing or two. And so the second part of ‘The Spirit of ’45’ ponders an altogether different mood than that in the 1940s: Thatcherism and the more recent failure of organised labour to live up to its founding principles. If ‘The Spirit of ’45’ might provoke David Cameron to raise his eyes skywards, it might also have Ed Miliband cowering behind an unwritten manifesto. Loach’s quiet, unforced position is that the left is equally guilty of abandoning the promise and passion of the post-war years. Yet, as political essays go, this is a tender, soft and humane film. It’s a compelling mix of interviews, old and new, with archive footage, much of it from old newsreels and public information films. There’s no voiceover, just faces and voices – the voices of ageing nurses, doctors, miners, union officials and others, alongside a handful of economists and historians. Some of Loach’s arresting interviewees, like Sam Watts from Liverpool and the former Welsh miner Ray Davies, recall what poverty looked like in the 1930s, reminding us why the welfare state was necessary in the first place. Others, like a trio of nurses from Manchester and the Welsh GP Dr Julian Tudor Hart, remember the excitement and the work of the early NHS. In fact, the NHS emerges as one of the film’s chief concerns: it’s both the great survivor of the welfare state and the institution of that age currently facing the biggest threat from political decisions. Ninety-odd minutes is not enough for this subject. There are inevitable omissions (no education, for example), and Loach makes a slightly jarring leap from a chronology of nationalisation that speeds through the 1950s and ’60s to the 1979 election of Thatcher. But always apparent is his clear thesis and the infectious commitment and fervour of his interviewees. The film works all at once as a lament, a celebration and a wake-up call to modern politicians and voters. Excellent, well-balanced review, constructively critical and informative. Great film which hits all the right notes. I too hope that the film is shown in schools. It shows why we had what we had and why some of us are fighting to keep it but most of all I hope the modern Labour Party takes its message on board too. There is absolutely nothing shameful about socialism. saw Spirit of 45 last night. Beautiful, strong, moving and rousing! Every school should show this film and discuss it. It's a powerful message to the current generation and the generations to come.